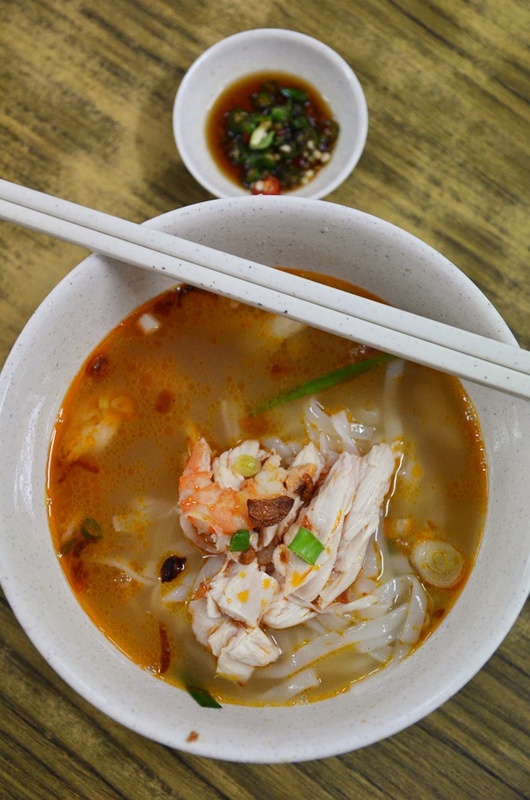 Up for a bowl of Ipoh Famous “Kai See Hor Fun” in Pasir Puteh? Just look at the deep, mahogany red-hued, concentrated stock made up of chicken and shrimp essences, accentuated by the flavours of fried shallots, chopped fresh spring onion and slices of firm, clean bites of poached chicken and boiled shrimps. 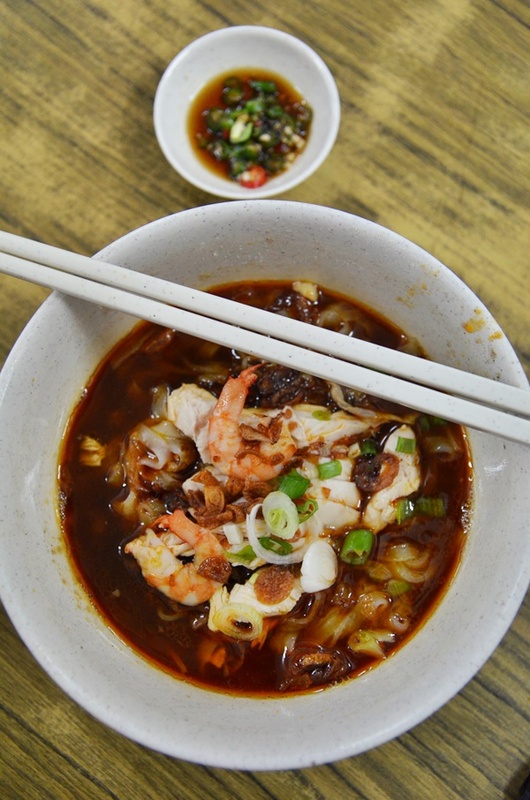 If you are one die-hard fan of ‘kai see hor fun’ (or chicken kuey teow soup), you would have had your cravings fixed at Thean Chun in old town or its ‘friendly’ competitor Kong Heng next door, or the now closed down Macy Café in Ipoh Garden East, or braced the wait for a taste of Moon De Moon’s version in Simee. I could have missed some of the others (such as Loke Wooi Kee‘s) but that could also be due to personal preference. But then, just when I was ravenously gorging down my curry mee at Tim Shun Loong recently, the affable man who is the owner of the coffee shop (and also a distant relative of ours) came seated and shared a few top notch picks with us; in particular, this stall in Pasir Puteh near to Peng Tau Restaurant (oh well, just one of the best ‘chu char’ restaurants in Ipoh!) that sells incredibly famous ‘kai see hor fun’ in the mornings. You would need to be there as early as possible (try before 9am on a weekend if you can withstand the grogginess after a week’s full of work), else you could be putting your attempt at risk and ending up with a gloomy scene of observing barren, chicken carcasses, empty bowls and satisfied customers walking away patting their stomachs while sniggering at your misadventure. Although waking up at such an early hour on a Sunday morning sounded ludicrous and to some extent crazy, I knew I just had to give this a try. More so to see for myself what the hype is all about, and whether this tops my favourite bowl of ‘kai see hor fun’ from Thean Chun. And a second reason being the fact that I am gradually distancing myself from Ipoh due to work commitments and career decisions, coming back for a marathon of Ipoh hawker food never sounded more appetizing. Unlike the conventionally-unexciting dry version of ‘kai see hor fun’ elsewhere, Ah Tiong does not simply toss in a mix of light and dark soy sauces and lazily scoop a bowl of soup on the side to justify the ‘kon lou’ version, instead, the impressive, robust flavor of the ‘dressing’ for the noodles consisted of a thickened brew of the chicken/shrimp stock as well, and the right balance of savoury/sweetness from the other components. Anyway, let’s skip the melodrama for now, and focus on the story at hand. The risk of letting Motormouth runs wild with his imagination and ramblings is that you might get a grandfather story’s worth of writings on a Monday evening to nurse your blues; or contribute adversely to that effect. 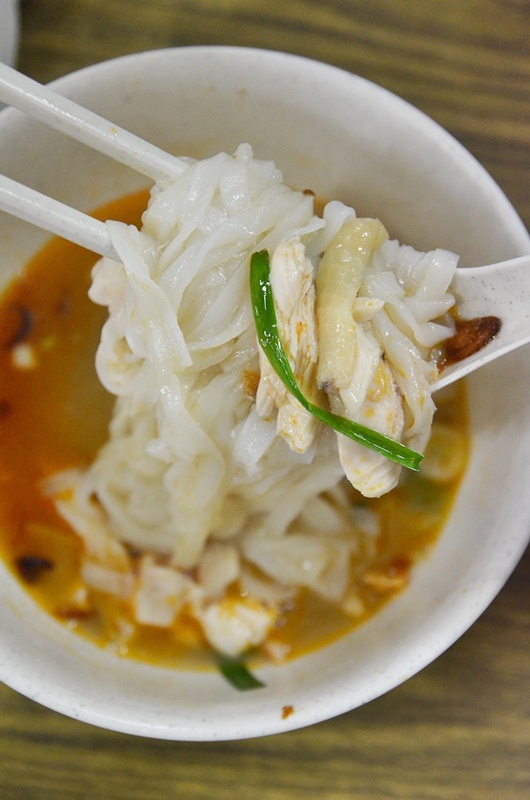 The strands of flat rice noodles (aka Ipoh’s sar hor fun or kuey teow) did not stick to one another, neither did they get all clumpy like a ball of dumplings within minutes of soaking in the soup); the velvety smooth quality of the noodles was evident and possibly one of their strongest selling points. We had to share a table with an elderly man who was an ex-politician from the Gerakan camp. We talked a little bit about Ipoh (there is always pride and a glitter in our eyes) and more about good ‘kai see hor fun’ finds in Ipoh (he preferred the one in Simee I mentioned earlier), and within 20 minutes or so, we were served. A small portion for MYR4.50 (I hope I remember this correctly), and the ensemble was all that I imagined. Sar hor fun that slithered down one’s throat, a heady brew of chicken and shrimp-infused broth with a natural umami taste not contributed by the addition of artificial flavourings (eg. MSG), sliced poached chicken and boiled shrimps, then garnished with fried shallots and chopped spring onions. Oh, not forgetting that side saucer plate of chopped ‘cili padi’ in soy sauce. Both the soup and dry versions were excellent; we could have ordered one of each and have a blast slurping in all the savoury goodness. But if you have to choose, and it’s your first time here, go for the soup version. The catch is of course, the distance that one would need to travel from city centre, or even further for us driving all the way from Ipoh Garden East. But seriously, this was well worth the time and effort, and possibly the sheer frustration of getting lost within the labyrinths of the Taman Bunga Raya neighbourhood, of sharing a table or trouble even finding one, and bracing the lengthy wait on weekends. 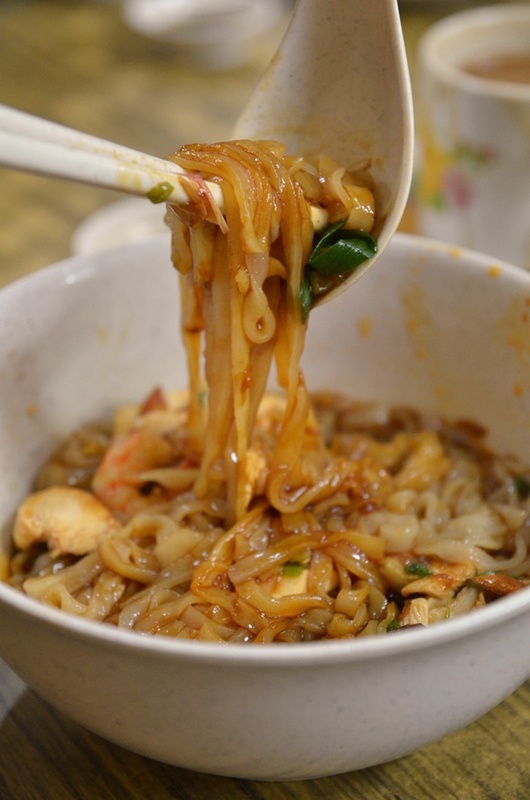 *The man behind the brand actually started selling ‘kai see hor fun’ back in the days for more than 10 years at Jen Jen Restaurant behind of Tow Boo Keong temple, and then he stopped selling noodles for a while and involved in other businesses. 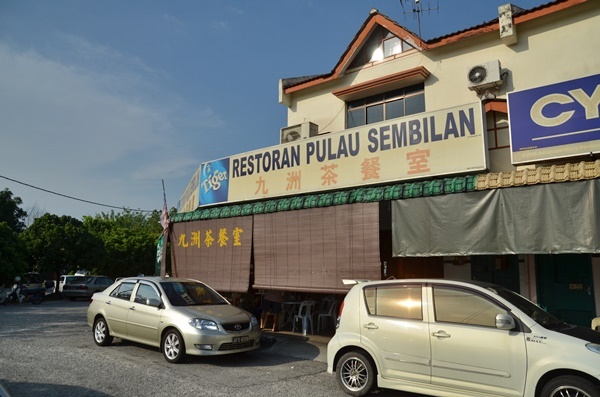 About 3 years back, he rejuvenated his brand of chicken kuey teow soup at Pulau Sembilan Restaurant in Pasir Puteh and has stayed here since. So my secret and favourite kai see hor fun joint is revealed. In my opinion this is one of the best other than the previous May See one. In fact I was just there this morning. 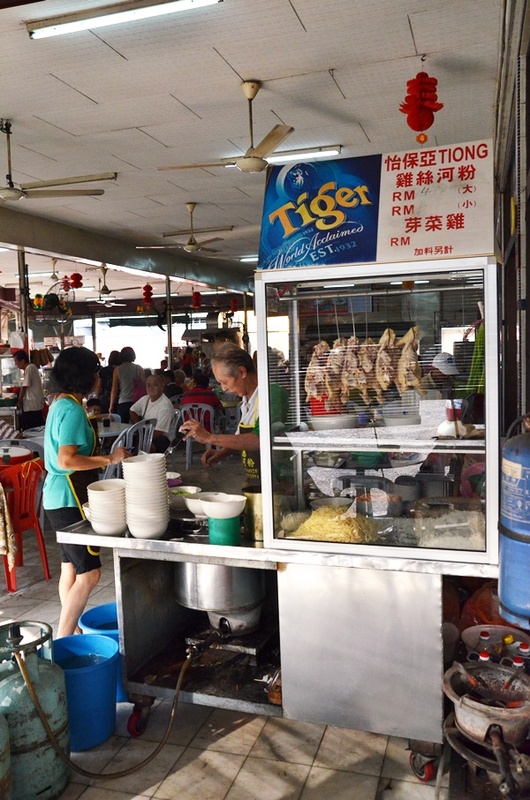 The original taste of Ipoh kai see hor fun. Always go there for this noodle whenever i m @pasir putih. This is good stuff. The only issue is the long queue. but then can always order the char keoy teow at nearby stall as appetizer while waiting for the main course.